The simulations in this section explicitly include processes related to the formation and evolution of galaxies. In particular, they include detailed phenomenological modelling of gas cooling, of star formation, of stellar population evolution, of feedback from massive stars and supernovae, and of galaxy merging using recipes outlined in Kauffmann et al (1999). In some cases, chemical evolution of the interstellar medium of galaxies and of the hot intergalactic medium is also included. 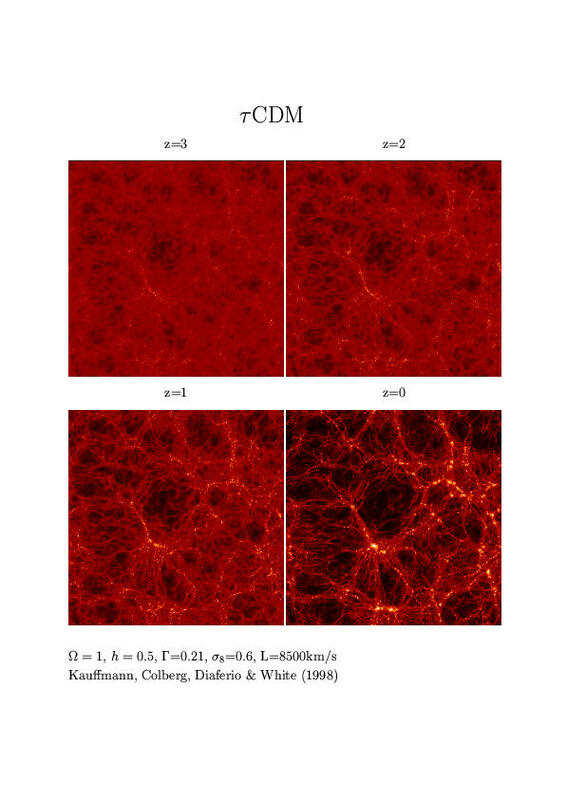 Scientists involved in the GIF project combined the large high-resolution N-body simulations with semi-analytical models to study formation and evolution of galaxies. The picture below, created by Joerg Colberg and Antonaldo Diaferio, shows the population of galaxies superposed on dark-matter distribution (grey-colored) in a small region of 21x21x8 (Mpc/h)3. (See also the picture of dark-matter distribution below.) Galaxies are shown as circles colour-coded according to their star formation rate: the sequence red, yellow, green and blue represents an increasing rate of star formation. At early times (top left panel) there exist only a few galaxies forming stars at a very high rate. As time goes on, from z=3 to z=0, more galaxies form and, at the same time, some galaxies run out of gas, form fewer stars and become green, yellow and red. At the present time (z=0), red galaxies populate the central region of the cluster, whereas blue galaxies can be found in the outskirts of the system. This is very similar to what is observed in the real Universe. For all of the following images the credit should be given to Kauffmann, Colberg, Diaferio, and White, see references. Pic.2 Dark Matter at z=0 plus model galaxies formed at different epoch (tauCDM). Top left panel only shows the galaxies which were formed at z>=3; top right panel shows the galaxies which were formed at z>=2; bottom left panel shows the galaxies which were formed at z>=1, and bottom right panel shows the galaxies which were formed at z>=0. 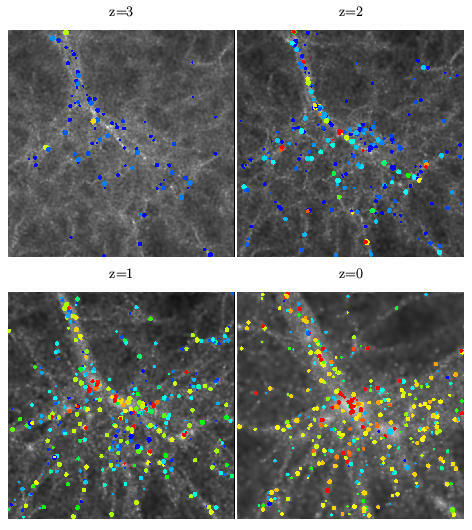 Galaxies are plotted at each redshift. Pic.4 Dark Matter distribution of GIF boxes of four different cosmologies. Pic.5 A slice of thickness 8 Mpc/h through the whole simulation box (which is 85 Mpc/h on a side) would look like this. The colours now denote the B-V colours of the galaxies, ranging from red for ellipticals to blue for irregulars. Pic.6 One of the clusters from the tauCDM simulation at z=0. The size of the region shown is 21x21x8 Mpc/h. Galaxy catalogues and dark halo catalogues for the LCDM model are available!